Eliminate Moisture Problems in the Basement. Don't let moisture ruin your basement refinishing job! The TBF system can eliminate moisture problems by installing an ENERGY STAR® dehumidifier and by using an exclusive selection of basement finishing products that can't support mold or be damaged by moisture. Different areas have different building codes. For example, if you build a home in Cincinnati, you don't need to waterproof the exterior of the basement walls. However, if you want to finish the basement a year later, basement walls will require a waterproofing treatment. "Ask the Builder" columnist Tim Carter recommends checking with your local building department before you begin to work on your basement. While your basement doesn't have as much natural light as the rest of the house, it does have a solid floor that can be an ideal base for a pool table, arcade games, or a treadmill and weightlifting equipment. Feeling artistic? Instead of trying to hide some of your basement's exposed joists and ductwork, you can paint these features to create an industrial, loft-like theme. It's worth it to spend time collecting design ideas that can help you envision the new living space you'll be creating. Take advantage of the free design consultation that's available with your TBF dealer. And make sure to check out our photos of finished basements. Aim to Finish the Entire Basement. Apart from the added cost of finishing the entire basement, this approach will leave you without a utility area where tools, luggage, and seasonal items can be stored. Your money will be better spent creating a premium-quality space in a more limited area. Since there's not much natural light coming in from outside, a finished basement needs a well-designed lighting scheme. Fluorescent lights, integrated into a finished drop ceiling, provide excellent general-purpose lighting that's also energy efficient. But you may also want a special light fixture, such as a decorative lamp over a pool table or a small spot light aimed at a dart board. It's the little things you do that will make your basement stand out and turn it into a room that everyone wants to be in. Add some decorative lighting around a seating area, put up some photos around your home office space, or hang a large mirror on the wall of your gym area. You can even give the room a theme. Installing a basement bar? Put in a retro jukebox and hang old record albums on the walls. Don't neglect finishes that you'd use for the rest of your house, either. Bob Villa suggests adding things like crown molding to make the room look more complete. Be Afraid to Express Yourself. This new living space is yours, so go nuts! Make it whatever you want it to be. Take your basement down a funky route by adding bean bag chairs, beaded curtains and a lava lamp, or add sports memorabilia so you can host Superbowl and World Series parties for years to come. Whatever you decide to do, let us help! A finished basement done right will increase the value of your home. Total Basement Finishing is a great system to start your basement design project with. Search through our site for great basement finishing tips and to get a free quote today! 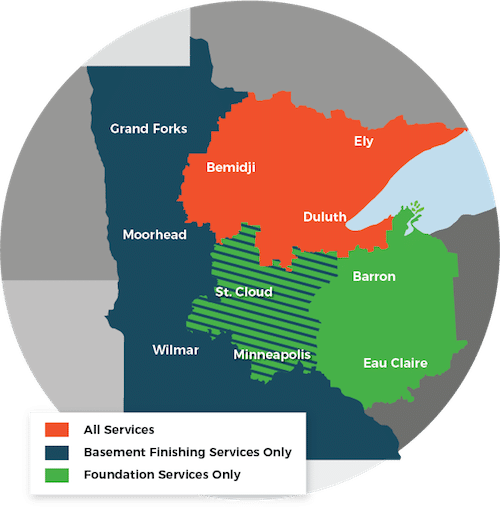 DBS is the exclusive TBF basement finishing contractor in the Greater Minneapolis, Superior, Duluth, Hermantown, Two Harbors, Cloquet, Esko, Virginia, Ashland, St. Paul area.